Your bike, your trips, your emotions. Now available for the new Multistrada 1260 S.
Those who ride a Ducati know: it’s not the destination that counts, but the journey. Whatever your destination, you can enjoy your bike’s technology, performance and comfort in any condition. And let yourself be carried away by the route, as you boldly take on every turn. With the new Ducati Link app, every trip becomes a memory to share and relive whenever you want! The app is available for all riders. Connection with the bike and data exchange is available for Multistrada 1260, 1260 S, 1260 S D | Air, 1260 Pikes Peak, soon available also for Multistrada 1200, 1200 S and Multistrada 1200 Enduro. If you already have a MyDucati account, you can access the app using those details. Otherwise, register and create your account right now. You can access the app and your profile via the Ducati site too, using the same credentials, so that you can add and manage your personal data and be kept informed with all the news direct from Borgo Panigale. Connect the app to your bike via Bluetooth and let the adventure begin. Thanks to Ducati Multimedia System technology, you can connect your smartphone to the bike. Available as standard on the Multistrada 1260 S, D|Air and Pikes Peak and as an accessory with the Multistrada 1260, it allows you to use your smartphone’s basic functions (calls, SMS notifications and Media Player) and connect the app to the bike’s control unit to record data and configure your bike parameters. Start your trip! During each riding session, the app records bike performance along the way, allowing you to refer back to data regarding the route and view maximum and average values. Speed, lean angle, power, acceleration and much more. Enhance each trip with data and statistics that you can save or refer back to at any time. Take full control of your Multistrada: configure and set all the parameters to adapt your bike perfectly to your riding style. It is quick and easy to set up the travel mode (load mode and riding mode) or configure the individual parameters of each riding mode (ABS, DTC, etc..) and the appearance of the dashboard, defining the electronic configuration that best suits your needs. View your stats any time you like, continuously monitor your data, check your progress and the course of your activities. With Ducati Link, you can analyse the stats of every single session while riding or at the end of your route, view data regarding any part of the route and check total activity recorded with the bike over time. Thanks to Ducati Link, information about maintenance intervals is always available to you, as is the user manual that you can browse any time you like. You can also find your closest Ducati dealer at any moment, so that you feel at home even when far away. Passion is contagious! Live your adventures to the full, discover and record new itineraries, share them with other like-minded individuals and be inspired. Add images, descriptions and comments to enrich your travels and inspire the community. Get connected Become part of a community of like-minded souls who love to travel on two-wheels towards new paths and together with new friends. Widen your network as well as your travel horizons! 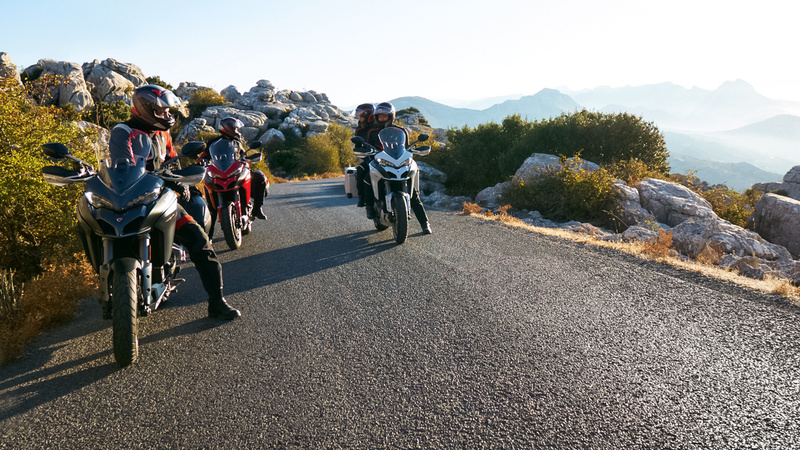 Participate Take part in Ducati events and organise a trip or a meet-up with your friends. Plan, publish and invite whoever you like! Your adventures in a post Share your activities and your travel diaries on social networks. Cross borders and tell everyone about your adventures!